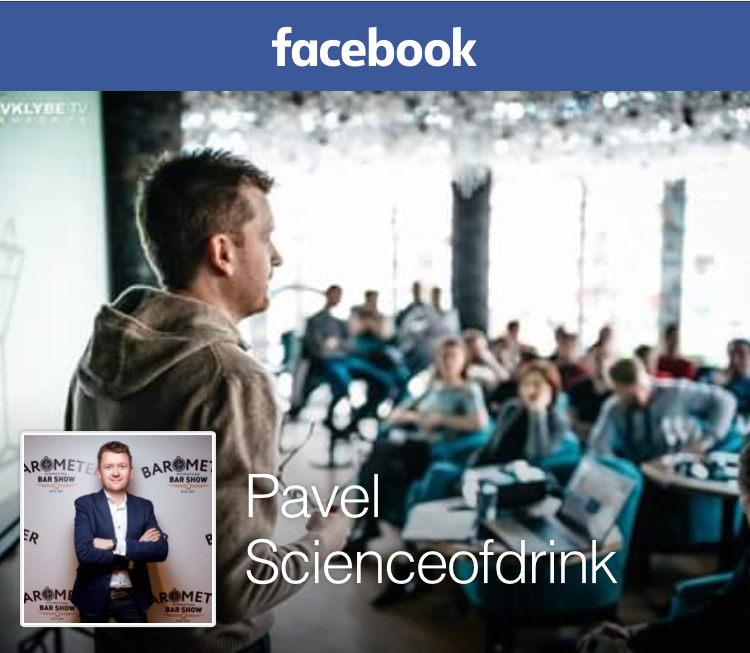 Posted on December 4, 2014 by Pavel Y. Every fall I obsess about the same thing – strong and aromatic cocktails with rum. 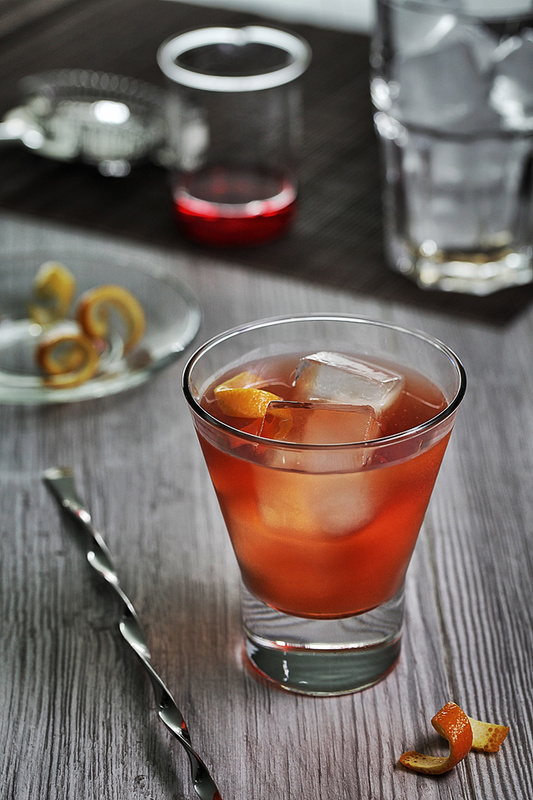 Additionally, I prefer pretty sweet and quite powerful drinks – like Old-Fashioneds or Negronis. However, that kind of mixes, especially with light rum, is so rare, probably, because substantially all famous light rum cocktails were invented in places with hot climate so they are sours [which I, personally, prefer primarily in the summertime]. That’s why I am very happy every time if I manage to find something interesting on that score. The Three Faces Cocktail was found on the CocktailDB several years ago. Actually, the CocktailDB is a very reliable source of worthy drinks, therefore, I suppose, this drink must have a certain reputable origin. Obviously, I made an attempt to investigate some facts about the Three Faces, at least to see what is the earliest time I could find it mentioned anywhere in print. But a solid hour of googling and flipping through a dozen old manuscripts and yet one dozen modern books, especially bibles, from the beginning of the past century up till now, gave me absolutely zero results. It seems like an absolutely rare cocktail with an unclear story. Pour liquors in a rocks glass filled with ice cubes. Stir and add a splash of soda then garnish with an orange peel. In spite of the fact that all the ingredients are (or even seem) branded liquor, there is room for several mixology experiments. First of all, it seems a perfect opportunity to play with two different versions of Galliano liqueur – Vanilla and l’Authentico. And, in any case, this is a chance to try some different stuffs that are called “light rum” [and also clarify the difference from a white one]. While I was at work on this cocktail I suddenly remembered that I had tasted this cocktail some years ago. I also found a diary note about making its acquaintance – at that moment I had mixed Three Faces with a certain white rum (it seems, it was Cuban Havana Club Anejo Blanco, my favorite light rum at that time) and Galliano Vanilla (old) liqueur. I’m pretty certain that I liked the drink, otherwise I wouldn’t have taken its pictures. But, it seems, I didn’t like it enough for blogging about. This time a first cocktail I mixed was with Campari, Galliano l’Authentico and Bacardi Superior. It is an excellent drink! 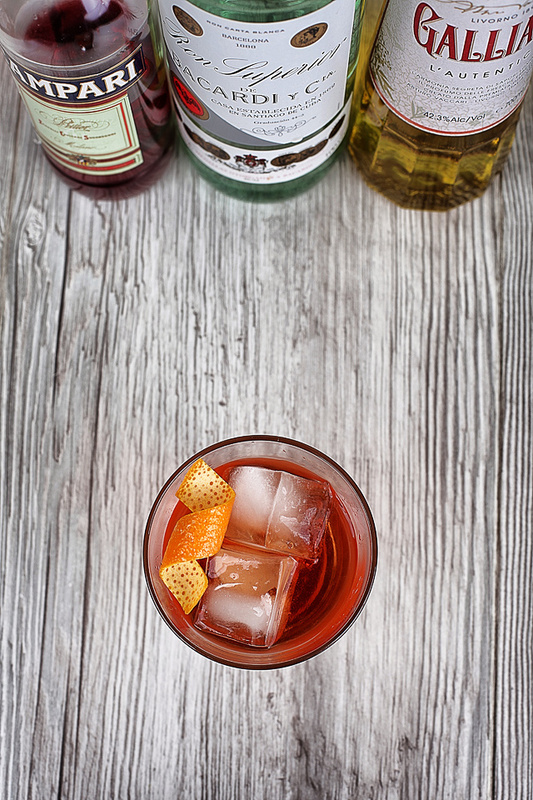 It was clear from the first sip – it is a terrific use of Galliano l’Authentico liqueur. Its compose botanical nose and a palate with a preponderant anise note complete this sophisticated digestif perfectly. You don’t need more than a couple of sips to realize that Galliano l’Authentico is a base spirit of this drink, as light rum isn’t more than a diluent. The main play goes between two distinctive Italian liquors, and I should admit it, their powerful tastes combine wonderfully here. Rum plays a supporting role – it fittingly dilutes and balances the mix. Perhaps rum does bring certain sweet rum-y notes, but it’s not so easy here. However Galliano Vanilla can’t stand up to Galliano l’Authentico in this cocktail. This version of Galliano looks too simple in the face of the authentic brother. Obviously Vanilla isn’t able to effect so voluptuously as l’Authentico. By the way, it is the first time than I’ve been so satisfied with new old Galliano l’Authentico [as opposed to in Golden Cadillac, but this is another story]. It seems like exceptionally worthy stuff. Rum contest was relatively short at this time. As a matter of fact Bacardi rum [I used not common Bacardi Superior but Bacardi Superior Heritage Limited Edition 44,1% – the anniversary edition of the famous rum. Posh, expensive and undoubtedly recognizable. ]… so, the rum worked pretty nice even in my first drink, but I decided to try something, you now, a little bit more flavorful in the drink. So I tasted several light rums of the Spanish tradition such as Matusalem Platino, Havana Club Anejo Blanco and 3 y.o. The first two rums give absolutely splendid cocktails but the other brings some odd notes that in fact ruins the drink [this also demonstrates the difference between light and white rums, by the way. All is not light that white, folks!]. Consequently, I refused tasting even more heavy rums in this cocktail. Мне нравятся в коктейлях и Кампари, и Гальяно, а вот вместе их еще не пивал) Должно быть очень даже. А как это ты с агриколем его не попробовал?) Думаешь, не пойдет сюда “колхозный” ром? За наводку на книжку спасибо, надо бы ее поискать в сети. Ты знаешь, есть в этих Трех Фэйсах что-то такое, что способно заставить меня раскошелиться на новую бутыль Гальяно:) А то критически небольшое количество этого ликера заставляет меня относиться к коктейлям с ним весьма избирательно;) Поэтому сделал его всего-то пару раз, и оба раза остался очень доволен. Не знаю, будет ли вам интересно, но у нас (в смысле, в Москве) некоторое время тому назад стал подаваться коктейль, содержащий Гальяно и Кампари вместе, но он без рома. Называется Итальянский шпритц (spritz(? )), и содержит, помимо названных ингредиентов, игристое вино Просекко. Павел, а где в Харькове Вы берёте Гальяно? Если я не ошибаюсь (сами понимаете, Гальяно я покупаю нечасто), я брал его в Классе – или на Алексеевке (где я обитаю), или на Клочковской в центре (около Роста) по пути из бассейна. My Grandfather created that cocktail in San Juan, Puerto Rico. His name was Horacio Santana. He was a bartender in a hotel in the touristic area of PR. My family think that the name was because he had tree childrens outside his marriage, 2 boys and 1 girl. He was a great bartender :). He died about 20 years ago.